Add optimal comfort to your bed with the SwissLux Firm Density Gusseted Pillows. 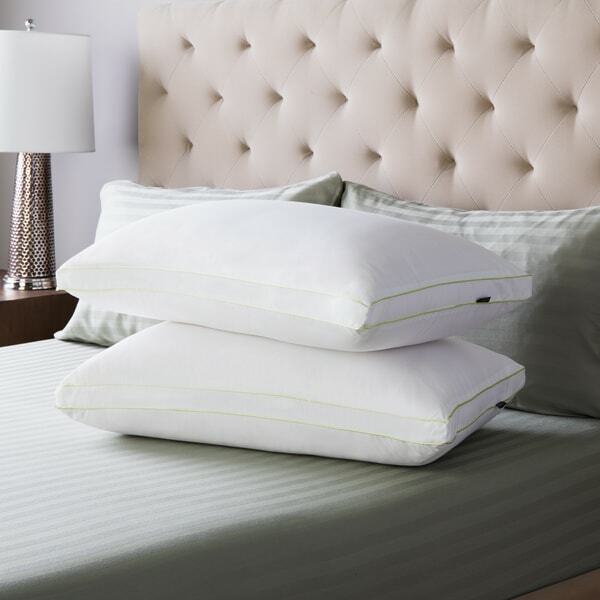 These pillows feature hypoallergenic polyester shells in white with PrimaLoft fiber fill that cradles your head and neck with firm support. I can't tell you how many king pillows I purchased that claimed they were FIRM and when I got them they were simply big and floppy. I am here to tell you these Puppies and FIRM and perfect for fillers for King Shams! I am so thrilled with the density of these pillows and if you like a firm sleep these are perfect and much better than memory foam. Again, firm but not hard. These pillows are okay, Not really worth the money. They are very fluffy in the sense when you lay your head in them the outsides lift up over the sides of your head. If you like that style then they are nice, but i need firm pillow and there’s nothing firm about these pillows. These pillows have held their shape and cushion fantastically over the months we've been using them. I bought them for the guest bedroom and to replace my husband's pillow, and found it so comfortable that I swiped the one from the guest room for myself. It's so soft, yet firm enough to support a side or back-sleeper with ease. very soft and firm pillows. Love the Size of the pillows. They are just the right firmness. They appear to be holding the form as well. Would highly recommend these pillows. Great firmness with particularly precise gusseting stitches around the edges. Extremely pleased !!! Bought these to fill decorative pillow shams. They are well made, almost too nice to just fill a sham. Great pillows! Used these for shams to make my Daybed a comfortable couch. They are lovely. Just firm and soft enough. Highly recommend. I bought all different sizes. I am so happy with all the pillows. Very nice pillows, not too soft or too firm. good quality for the price. was very surprise how nice and firm they were. will definitely being ordering more in the future and will definitely recommend to my friends. This was an idea addition for shopping for spring ! Queen size pillows are larger than described. I could not get them into any of my standard queen pillow cases. Overstock charged me $*** in return shipping which is pretty much the cost of the pillow set. Ridiculous! I have always had a hard time finding pillows I like. Finally! These are perfect. You dont wake up with a stiff neck.